Cisco NAC Profiler is an OEM software from Great Bay Software’s Beacon product(Read more). The basis and need for NAC Profiler is to secure Non-Responsive Hosts(NRHs). This is performed by using state of the art Endpoint Profiling and Behavior Monitoring technologies. Endpoint profiling is defined as recording a network endpoint’s observable behaviors and analyzing identifiable characteristics of the endpoint in order to classify it as belonging to a particular group (Profile) and to assess each endpoint’s ability in a certain sphere. That certain sphere could be an endpoint’s ability to participate in a given authentication or Cisco NAC Appliance as an example. In essence, Endpoint Profiling is best described as behavior-based characterization of endpoints for the purpose of identifying and grouping together those that are similar in function, capability or other defining characteristics. 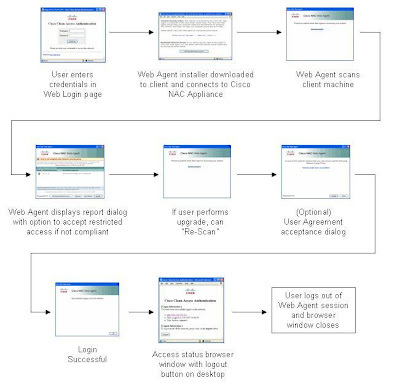 Behavior Monitoring is the ability to ensure endpoints are behaving in a way that is consistent with the classification leading to being provided with the authentication or NAC accommodation, and not indicating behaviors associated with endpoints that should in fact be participative in the full authentication or admission control process prior to being allowed onto the network. Enough with the formal definitions (that’s what the great documentation is for), what is the real value of this solution to an organization with or without Cisco NAC and pre and post deployment of Cisco NAC? When planning for a NAC Appliance deployment the question of NRHs is sure to come up. How does someone find all of the Printers, Game Consoles, UPSs, IP Phones, etc. in the network? The answer is never easy. The bottom line is that the average organization’s network consists of over 50% of devices that are NRHs. The traditional method of accounting for NRHs is to manually find and record all MAC Addresses and import all of them into the NAC Manager’s Device Filter list. The challenges that this method presents are resources(Who is going to perform this task), Human Error(48bit MAC Addresses can start to look very complex after writing down hundreds or thousands of them), Adds/Moves/Changes become a nightmare, and by the time you finish recording all of the devices you can guarantee that something has changed since you started. It becomes very clear how many hours can be saved by implementing Cisco NAC Profiler just from the above. But wait there is more… The above shows how Endpoint profiling can be used to save time and headaches, but the Behavior monitoring goes a step further into the value of NAC Profiler. Take the example of the traditional method of adding NRHs into the device filter table of the NAC Manager: Once a printer’s MAC Address is added it is always there, so if a malicious hacker or auditor walks up to the printer, prints the properties page, gets the MAC address, then he or she unplugs the printer and uses the MAC address of the printer to gain access and bypass NAC. If NAC Profiler is implemented, once the computer that is spoofing the MAC Address of the printer exhibits behavior that is outside of the typical behavior of the printer, that user will be kicked off of Device Filter list and be forced to go through standard NAC Process. Another key benefit of having NAC Profiler is the accountability and visibility into the devices on the NAC Manager Device Filter List. As devices are placed into the Device Filter list by the Profiler Server, there is a link placed that brings an administrator directly to a page showing which switchport the device is plugged into, the respective endpoint profile data, and when it first came on the network. Any Network Operator understands the value of understanding where devices are at and when they entered and left the network. - Collector Module: Gathers information about endpoints using SNMP, NetFlow, Sniffing, and active profiling. Software already installed on the NAC Server, license activates the feature. The profiler server can be and is recommended to be configured in an High Availability(HA) pair. The Collector license should be purchased for each NAC Server that will be used to profile devices. If the NAC Server is a HA pair the license should be purchased as an HA license. For the latest information about licensing of Cisco NAC Profiler, please refer to the Cisco NAC Profiler Data Sheet. NAC Profiler uses many data feeds to obtain the required information to perform Endpoint Profiling and Behavior Monitoring. The following list gives you the background of how the collectors gather data. This information is used to Build and maintain a model of the network topology within the Endpoint Database. - NetTrap Collector component module that receives selected traps from network devices to assist NetMap in maintaining the model of the network topology. - NetWatch The passive network analyzer collector component module. Collects information about endpoints using network traffic received at one or more of the interfaces on the appliance it runs on. - Forwarder Facilitates communication between the collector and the server, acts as middleware between Collector modules and the Profiler Server. Each NAC Profiler deployment may include a few of these or all of these depending on the required amount of data. As a best practice it is always good to start by using NetMap, NetTrap, and NetWatch to gather the relative information required to successfully profile endpoints. If any of these collectors are not available in the organization deploying NAC profiler, utilizing the NetInquiry or NetRelay collector is a great alternative. Please note that other than NetInquiry NAC Profiler is completely passive and does NOT actively send traffic to any endpoint. As of version 2.1.7, NAC Profiler comes with 38 default profiles out of the box. This includes many of the major device types in enterprise networks today. - MAC Address – Beacon maintains a list of all OUI values for MAC address vendor assignments. MAC Vendor rules allow the endpoints MAC address to be used as a criteria for classification into a Profile. - IP Address – Beacon can use the host address of endpoints to classify devices using host IP addresses within a designated range as a criterion for classification into a Profile. - Traffic – analysis of traffic information at layers 3-4. Based oninformation gathered by either the NetWatch collector module (traffic analysis) or NetRelay collector module (Netflow data exported from a Netflow-capable device). - TCP Open Port – Layer 4 port information that is gathered either by monitoring SYN-ACK information passively or via the Active Profiling capabilities of NetInquiry. - Application – analysis of application layer behavior including DHCP, Server Banners, DNS names, User Agents, etc. - Advanced – used to create complex expressions using AND, OR, and/or NOT, or to aggregate multiple rule logic into a single rule. Cisco NAC Profiler is an amazing add-on to the Cisco NAC Appliance portfolio and shows value for any organization that current has or plan to have Cisco NAC Appliance. Please stay tuned for more best practices, advanced configuration and troubleshooting of Cisco NAC Profiler. deployment, customers can apply policies and access prvileges to non-PC endpoints. Most training courses prepare individuals for certifications, but Priveon's Real-World training is the exact opposite. Their new Cisco NAC Appliance class is focused around how to design, deploy, operate and optimize Cisco NAC. With 20 labs and a topology that mimics typical organizations' environments, the class is very impressive and valuable for everyone interested or involved with Cisco NAC Appliance! I have personally reviewed the class and I highly recommend it to anyone wanting to take their expertise to the next level. For those of you who missed the NAC Chalk Talk I did on Thursday, here is the link to the Video on Demand, so that you can catch some of the deployment best practices. I also want to thank the NAC Appliance Business Unit at Cisco and specifically Prem who hosted me out in San Jose, he is the real Rock Star! Watch this interactive session to learn Force 3's secret to NAC success, key deployment strategies and how they use Cisco NAC to solve their client business requirements. There will be additional chalk talks continuing the weeks following the 13th, so be sure to check back here for updates on the others! Cisco posted a new Configuration Guide on how to configure and troubleshoot Antivirus Definition Updates. This is relevant for any deployment using Cisco Preconfigure AV definition rules. Cisco NAC Profiler is here, and let me tell you this product makes deployments go a lot smoother. How nice is it not to have to find all of your Printers, IP Fax Machines, UPS management, Game Consoles, etc. I just wanted to give everyone the update on the NEW NME-NAC-K9 module. They are supported as of version 4.1(2). The Cisco NAC Network Module (NME-NAC-K9) implements the Clean Access Server functionality on the next generation service module for the Cisco 2811/2821/2851 and 3825/3845 access routers. The NAC network module is pre-installed with Cisco NAC Appliance software release 4.1(2) (or later), with the Clean Access Server software running as the application code. The Clean Access Server operating system is based on an optimized version of Linux. The NAC network module is an ideal NAC solution for small groups of users in remote locations where an integrated services router is used. The NAC network module can be equipped with either a 50-user or 100-user license to support branch offices. I want to start out by saying that this book completely exceeded my expectations for the first NAC Appliance book. I wish this was published 3 years ago. The author clearly articulates the business benefits of NAC, including how NAC provides return on investment (ROI), which gives any reader the know-how to wisely purchase Cisco NAC Appliance. He also shows his technical expertise by diving extremely deep into the inner workings of Cisco NAC Appliance, which gives engineers, consultants, and operations the information they need to successfully deploy or maintain the product. This book shows great details into the process flows of In-Band & Out-of-Band users, Clean Access Agent (CAA) users and network scanning users. The information on the different deployment options and how to use them in diverse environments is great to start your NAC Design. This book makes the confusing topics seem easy and manageable. Layer 3 OOB Deployment options – Walk through of the benefits of the different methods of deploying L3 OOB, e.g. PBR, ACLS, VPNs, etc. All in all this is a great book and I would recommend it for all people interested in Buying, Deploying, Operating, or Troubleshooting Cisco NAC Appliance. This is definitely a great reference manual to have at your desk! New to 4.1.1, WSUS Requirements gives NAC Appliance administrators the ability to seamlessly integrate with local WSUS servers or utilize Microsoft Servers to ensure users are up to date on their microsoft service packs and patches. Update Validation source - This involves checking to see if a particular client machine is up to date with patches. This check can be done against the WSUS server itself OR against Cisco rulesets. Cisco Rules - In this case, the new “WSUS Server Update services” requirement needs to be mapped to the standard Cisco rule sets such as XP_hotfixes etc. Standard registry scans will be performed on the client machine based on these rule sets. WSUS Server - In this case, the CCA Agent makes an API call to the WSUS Agent on the client machine to check compliance. Since our rule set is not used here (direct interaction between WSUS client and server, no need to map the Rule set to the requirement. WSUS Servers - Download and Install the patches from the local WSUS servers. Update Installation type - This involves deciding what type of hotfixes should be downloaded and installed from the chosen source. Custom - Use this setting and the associated dropdown menu to install updates based on their severity by choosing Critical, Medium, or All from the associated dropdown menu. If you select Critical only the most severe/critical Windows updates are installed; selecting Medium means all updates (except for those classified as "low severity" by Microsoft) are installed; selecting All means that all of the currently available Windows Updates are installed, regardless of severity. Upgrade to Latest OS Service Pack - automatically install the latest service pack available for the user's operating system. WSUS updates may take long. So, it is important to set the Session Timer for the temporary role long enough to allow enough time for the updates to complete. In order to support Windows Server Update Services operations, client machines must have version 5.4.3790.1000 (or a more recent version) of the WUAUENG.dll file installed. If there are update errors, see C:\Windows\Windows Update.log or C:\Windows\WindowsUpdate.log. To see if you have a Local WSUS server configured go to HKLM\SOFTWARE\Policies\Microsoft\Windows\WindowsUpdate and the "WUServer" key will have the server listed. WSUS Requirements are a great new best practice method to ensure Microsoft is truly up to date. Audit—Silently audit. The client system is checked "silently" for the requirement without notifying the user, and a report is generated. The report results (pass or fail) do not affect user network access. Optional—Do not enforce requirement. The user is informed of the requirement but can bypass it if desired (by clicking "Next"). The client system does not have to meet the requirement for the user to proceed or have network access. Mandatory—Enforce requirement. The user is informed of this requirement and cannot proceed or have network access unless the client system meets it. Next, you should change all of the previous AUDIT requirements to OPTIONAL requirements. This will still allow users access, in case of any discrepancy in your policy or remediation strategy, but will get them through any hurdles of learning how to self-remediate. Finally, utilize MANDATORY requirements to ensure that all policy is enforced. The last major idea that should be taken into account is how to schedule this type of roll out. I typically recommend 30-45 days for AUDIT requirements and then 30-60 days for OPTIONAL requirements, but this must be determined on a per organization basis. The key thing to take from this posting is that you do have this wonderful option to phase the enforcement of policy for your NAC deployment and it will help ensure a smooth transition for administrators and end users. One less talked about configuration option that you can use to make your NAC deployment more successful. Release 4.1(2) introduces support for the Cisco NAC Appliance network module (NME-NAC-K9) on the next generation service module for the Cisco 2811, 2821, 2851, 3825, and 3845 Integrated Services Routers (ISRs). The Cisco NAC Network Module for Integrated Services Routers supports the same software features as the Clean Access Server (CAS) on a NAC Appliance, with the exception of high availability. NME-NAC-K9 does not support failover from one module to another. The integration of CAS capabilities into a network module for ISRs allows network administrators to manage a single device in the branch office for data, voice, and security requirements. The NME-NAC-K9 network module is available as a single hardware module with 50-user and 100-user license options, and supports a maximum of 100 online, concurrent users. 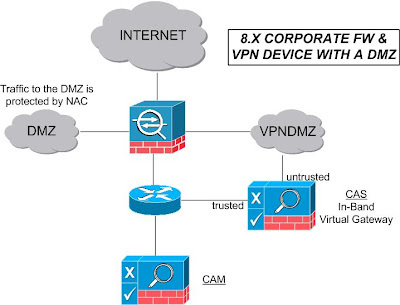 Once initially installed, the Cisco NAC network module is managed in the CAM web console like any other Clean Access Server, and a single CAM can manage both CAS appliances and NAC network modules. To add the Cisco NAC network module to your network, at least one Clean Access Manager appliance (Lite, Standard or Super) must be already installed and configured. Cisco ISR platforms need to run Cisco ISO software Release 12.4(11)T or later (IP Base image or above) in order to support the Cisco NAC network module. If introducing the Cisco NME-NAC-K9 network module to an existing Cisco NAC Appliance network, you must upgrade all CAM/CAS appliances to release 4.1(2) for compatibility. Device Management > CCA Servers > Manage [CAS_IP] > Network > IP | new Platform field featuring either "APPLIANCE" or "NME-NAC"
Administration > Network Settings > IP | new Platform field featuring either "APPLIANCE" or "NME-NAC"
The CAS CLI includes the new service perfigo platform command in release 4.1(2). The command allows you to determine whether the CAS is a standard Clean Access Server appliance or a new Cisco NME-NAC-K9 network module installed in a Cisco ISR router chassis. The command output includes either "APPLIANCE" or "NME-NAC" as the platform setting. Beginning with release 4.1(2), you can now specify the number of days of collected debug logs to download in order to aid troubleshooting efforts when working with Cisco technical support. Previously, debug logs compiled to download to technical support included all recorded log entries in the CAM/CAS database. The default setting is one week (7 days). Please note that it is best practice to follow the upgrade procedures to the "T" when upgrading your NAC Managers and Servers. 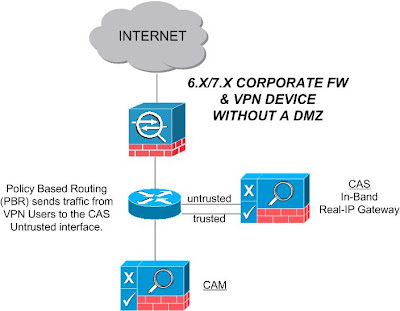 Cisco posted a new Configuration Guide on how to configure and troubleshoot ADSSO. This is relevant for any deployment using ADSSO and also has some great text on the common error messages and associated resolutions. Great Bay Software Inc., the innovator of Endpoint Profiling for enterprise networks, today announced it has signed a worldwide OEM agreement with Cisco that adds the company's Beacon Endpoint Profiler solution to the award-winning Cisco Network Admission Control (NAC) product line. This agreement ensures that all network-attached endpoints, including non-PCs, meet the specified requirements for network access, creating the industry's most comprehensive NAC solution set. As part of the agreement, Cisco will rebrand and sell the Beacon Endpoint Profiler as Cisco NAC Profiler. 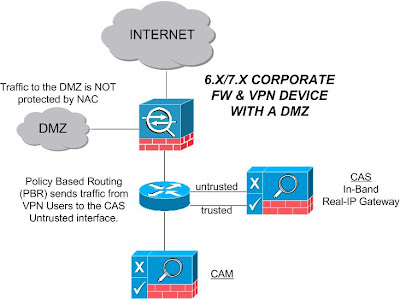 The Endpoint Profiling and Behavior Monitoring functions provided by NAC Profiler combined with the Cisco NAC Appliance solution will ease deployments and improve the security management of endpoints unassociated with specific users, such as network printers, medical imaging devices, IP phones, HVAC sensors and wireless access points. NAC Profiler can improve the return on investment for a NAC deployment by dynamically tracking the movement of these devices on the network. The Cisco NAC Profiler provides a number of benefits both in the initial implementation of NAC and throughout the entire lifecycle of a deployment. Great Bay's Endpoint Profiling technology generates an automated inventory of all endpoints, significantly reducing the level of effort required in the implementation of NAC. The Cisco NAC Profiler informs the NAC system of critical endpoint data, including device address information, a type descriptor (printer, phone, AP, UPS, etc. ), access type (a value that defines the appropriate level of access for that endpoint) and access to additional information about that device and its history in the network. This eliminates the need for manual inventories and data entry. "We're excited to extend our collaboration with Cisco and to be part of an end-to-end NAC solution that provides a security model for all network-attached endpoints," said Steve Pettit, president of Great Bay Software. "Customers will benefit from Cisco's global business infrastructure and from the ongoing innovation this relationship will continue to deliver." "Great Bay Software's endpoint profiling enhances an end-to-end NAC solution strategy," said Nick Chong, head of the NAC Appliance line of business for Cisco. "Cisco NAC Appliance, the leading NAC offering in the marketplace today, continues to represent the latest in technical innovation involving NAC, and adding Great Bay's profiling technology enriches our overall NAC solution." Cisco's NAC Profiler will consist of two functional components in the NAC Appliance solution: the Profiler Server and the Collector Application. The Profiler Server will run on a dedicated appliance while the Collector Application will reside on the Cisco NAC Appliance Server. Cisco NAC Profiler is scheduled to be available in August 2007. Great Bay Software Inc. is the innovator of Endpoint Profiling, a technology designed to rapidly establish and maintain a real time view of all network attached endpoints. 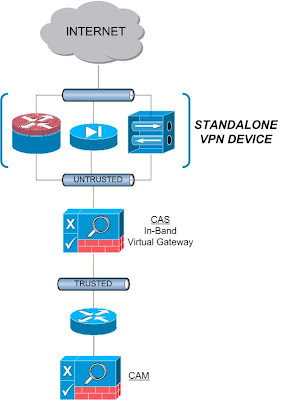 The company's Endpoint Profiling technology has applications in enabling the deployment and administration of Network Admission Control and network-based authentication, in addressing compliance concerns related to unauthorized devices attaching to the Enterprise network, and in managing the endpoint lifecycle for all network attached devices. I have been working with beacon for over a year now and have had nothing but success for deployments and the customers on-going operations. It is the fries with burger when it comes to NAC in an enterprise environment. Next time you are planning a NAC deployment for your integration or are sick of adding device filters every time a new phone or printer is brought up check out Beacon! Cisco NAC Appliance is a great method of threat containment by ensuring users' identity and posture, but at what point do you want to ensure that the user whom has once been compliant is still indeed compliant? This is the reason why timers are such an important aspect of any NACA Deployment. This entry will help you to understand the different options within NAC and ensure that you configure what is needed for your deployment. ALWAYS configure Certified Device Timers to enforce posture assessment after X amount of time for any Layer 2 or Layer 3 Deployment. Use Heartbeat Timers to automatically remove inactive users when using IB. Use User Role Session Timers for timeout of the Quarantine/Temporary User Roles and if you have a per role maximum connect time that is less than 1 day. No matter where you are deploying NAC the discussion of how often you need to re-authenticate/posture assess a user should come up. Hopefully, you will understand the need and plan appropriately for you deployment. For more information on how to configure these timers, please read the CAM Admin Guide or for hands on experience and instruction, please consider taking Priveon's Cisco NAC Appliance Special Operations Class.